These may not be best pictures you've seen of Hollywood heartthrob Hugh Jackman but the message they carry is rather significant. 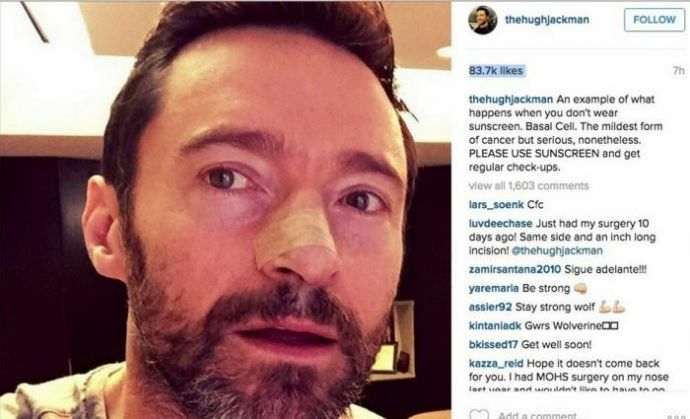 After having a fifth skin cancer removed, the X-men actor posted a couple of his photos on Instagram - urging people to wear sunscreen and get regular skin checks. 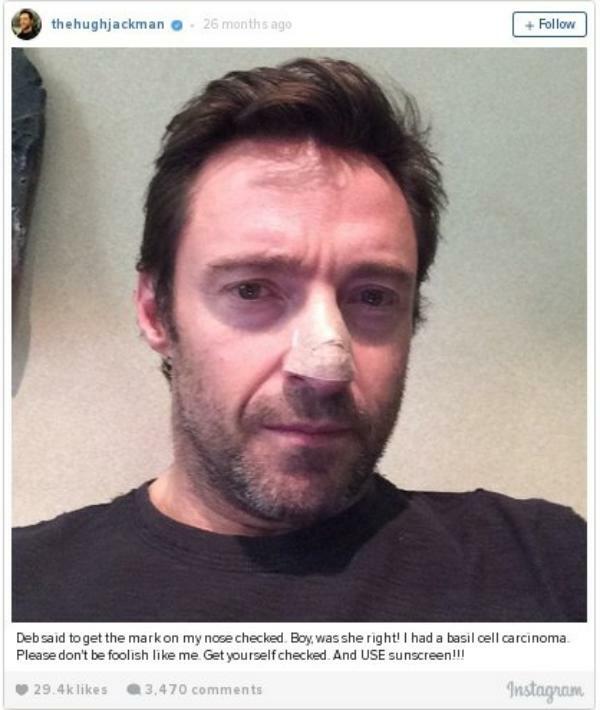 The actor recently had a basal cell carcinoma - a very common and non-invasive type of skin cancer - removed from his nose. Jackman says he gets skin checks very three months. The actor got such cells removed from his body four times before the recent treatment. In 2014 he told reporters: "I'm realistic about the future and it's more than likely that I'll have at least one more but probably many more, which is not uncommon for an Aussie particularly from English stock growing up in Australia where I don't remember ever being told to put sunscreen on." This basal cell carcinoma (BCC) is one of the most common types of skin cancer found in Australia. It accounts for about 70 per cent of non-melanoma skin cancers. Australia records about 500 deaths a year from non-melanoma skin cancers, according to the Cancer Council. The carcinoma originates in the lower layer of the epidermis (top, outer layer of the skin). It can appear anywhere on the body but most commonly develops on parts of the body that receive high or intermittent sun exposure (head, face, neck, shoulders and back). BCC often has no symptoms and tends to grow slowly without spreading to other parts of the body. If you notice a pearly lump or a scaly, dry area that is shiny and pale or bright pink in colour, then get it tended to immediately. There is no organised screening program for non-melanoma skin cancers.